Lyme Middle Schoolers learn how to "stop the bleed"
The Lyme School is very fortunate to have community members with many talents. 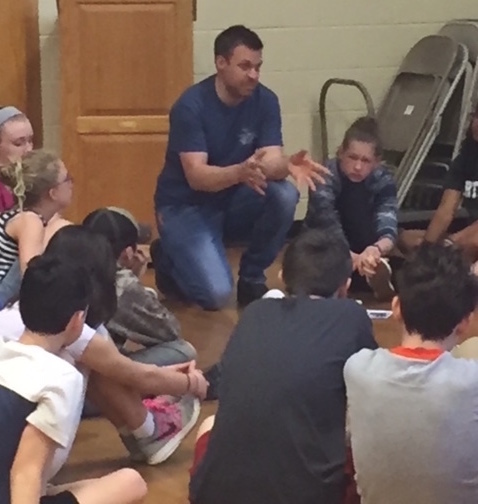 On May 11, Andy Miller, Lisa Rayes, and Aaron Rich, members of the Lyme Fast Squad, worked with students in grades 6-8, teaching them techniques in first aid specific to bleeding. This was a mini class of our larger course called "Stop the Bleed". Students rotated through each instructor, learning ways to stop bleeding in the case of an injury. This was a second part of instruction, which included having students learn CPR earlier in year. This is a valued piece of the school's health education program and we are grateful for the time that Andy, Lisa, and Aaron have given to learn these life (saving) skills.